Here we are yet again, another tragic episode and senseless loss of life in Las Vegas. These are challenging times….between the hurricanes, political landscape and mass shootings, it is enough to cause us all to want to go in bed and pull the covers over our heads. If you think there is no way out of this mess then it is understandable that you want to turn away and divert your attention to anything else. But we have to live for another possibility. We have to walk in faith and the belief that we can actualize change. When we believe that we are too small, too weak, too limited in numbers to make a difference we diminish our power. The truth is that change never happens by the masses, it happens at the grass roots level. Think of the historic changes in history…Gandhi and the British Empire, Martin Luther King, Jr. and the Civil Rights Movement. These men are viewed as heroic figures today, but at the time there was much opposition to their views and non-violent approach to changing hearts and minds. Now more than ever, let us reflect on what it means to take a non-violent approach to our own life. What part can we play? We can choose love over hate every day in a thousand different ways. We can make a difference. Every time we choose to act from love when we could choose to act from hate we are making a difference. We are all connected. We are all one. When we see others in the light of love and forgiveness it not only improves our own life, it improves the life of everyone we come into contact with – the result is a life that is fuller, richer, deeper and more joy-filled, for you and everyone your life touches. We are all in this together, let’s pull ourselves up and dig deep during this most critical time in the world. 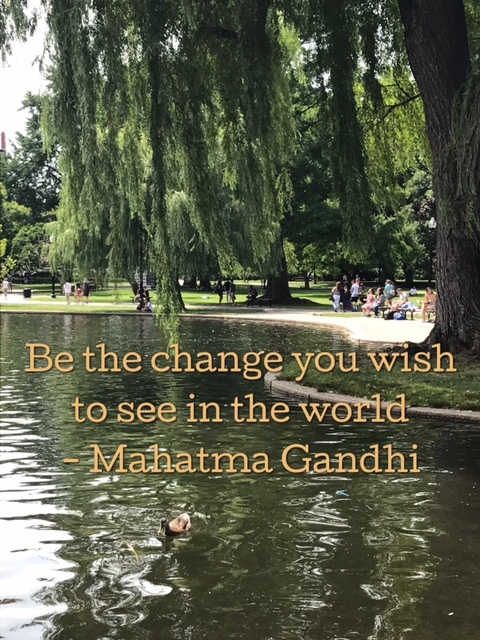 I have been moved and inspired by re-visiting Gandhi’s Nonviolence Principles. I want to include them here as a reminder of what is possible when we make love our first, last and only viable solution. Human beings are more than the evil they sometimes commit. The means must be consistent with the ends. We are called to celebrate both our differences and our fundamental unity with others. We affirm our unity with others when we transform “us” versus “them” thinking and doing. Our oneness calls us to want, and to work for, the well-being of all. The nonviolent journey is a process of becoming increasingly free from fear.